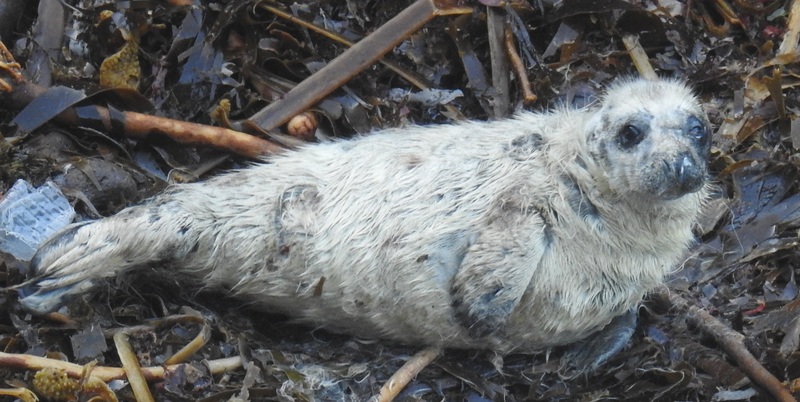 On Wednesday the 3rd of November I got a call from BDMLR who in turn had been contacted by Sue from Cornwall Seal Group (CSG) as CSG volunteers, Alec, Enid and Terry, on the Lizard were concerned about a little pup on one of the coves on the west side of the peninsular. Initial observations and assessments by CSG and British Divers Marine Life Rescue (BDMLR) had been made on the two days prior to the call. It had been agreed by all parties to continue to monitor the pup as it was a borderline weight and whilst rather scruffy had no obvious injuries, although there was a suspicion of something wrong with its eye that could not be confirmed until the second day. It was hoped that it might still be with its mother. The cove is rather remote and it was thanks to everyone’s passion for monitoring and protecting these endangered (but amazingly charismatic animals) that Sue was able to inform Dave from BDMLR and Dan from the Cornish Seal Sanctuary to make the rescue possible. I love how brilliant our local marine conservation network is and how committed individuals all across Cornwall will go out of their way to ensure we do our best to look after our marine wildlife and report any problems so action, if needs be, can be taken. I was in a lecture all afternoon but as soon as that was finished I arranged to meet Toby (my other half), Terry and Dan with the Cornish Seal Sanctuary land rover (landy) so we could go and make an assessment. We needed the landy as the remoteness called for a lot of skillful driving on Dan’s part to get the equipment required as close as possible to the pup’s location on a little used farm track which was over grown and very muddy. Terry’s local knowledge meant this was possible and without him (and permission from the National Trust) we would have had to carry the pup a good few miles, which would have caused added stress to the poorly animal not to mention our backs. After a bumpy ride down to the top of the cove we climbed to the cliff top to observe for a minute or two and could see only the half moulted pup a quarter of the way down the beach. There were still no other seals in the area. We scrambled quietly down to the beach which was covered in an awful lot of rubbish. I wish I had taken a photo but intend to go back with a rubbish bag as soon as pup season is over, it was really bad! Not looking very well; Photo taken by Alec and Enid. 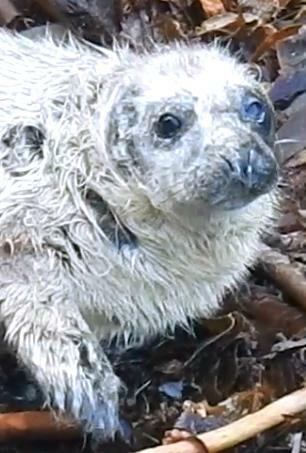 We approached the little seal, who was actually quite a big pup around the weaning age of three weeks, there was a sea of moulted white fluff blowing around in the breeze and where it had come away there were visible small wounds. Dan decided we definitely needed to make a physical examination and asked if I would like to catch the pup. I used a towel to pop over the seal’s head and gently pinned him with my legs holding the towel firmly around those jaws which I know from experience contain lots of sharp teeth. We looked over his body and found some of the wounds to be infected in addition to a bad eye and a high temperature so the decision was made to take him to the Cornish Seal Sanctuary (CSS) Hospital for further treatment. 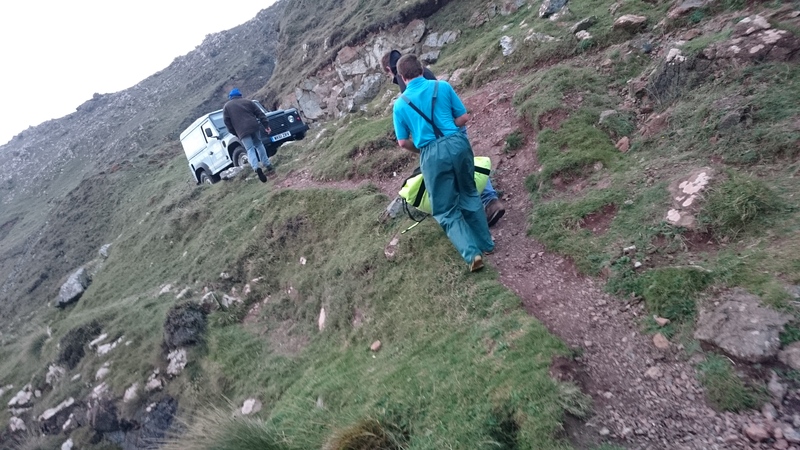 Once Dan and I placed the pup into the bag he, Toby and Terry took it in turns to pass the bag up over the boulders and make the steep climb back to the landy. 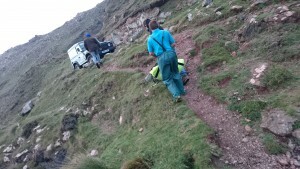 We soon had him in the seal cage and safely loaded into the back, so were off back up the hill. We all decided on the name Rummy mainly because I thought we could have all done with a little tot of rum after the scramble back up the hill! Especially as he was such a big boy! He was very subdued though and it was clear he wasn’t very well. The next day I called the Sanctuary and Tamara, the Animal Care Team Supervisor said Rummy was doing well and is expected to make a full recovery but they are keeping close watch on his poorly eye. 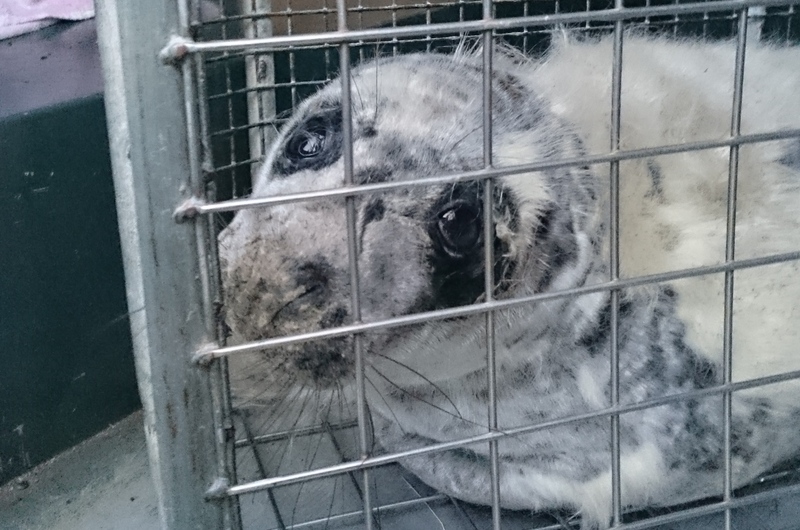 Well-done to everyone involved in his rescue, I look forward to early next year when he will hopefully be released back to the sea and can enjoy his second chance at being a wild seal. I feel proud to be part of such an amazing marine network who as I have already mentioned, work so hard and do such an awesome job at protecting our marine wildlife here in Cornwall. Between August and January every year there are grey seal pups born around our coastline. If you find one please don’t disturb it, just watch from afar and try to take pictures which you can send to Sue ([email protected]) or BDMLR. It is likely Mum is watching from just off the beach and won’t come out to feed her pup if she knows you are there. If you have an immediate cause for concern you can call BDMLR on 01825 765546 (or 07787433412 out of office hours).